…to which the answer is, YES! We know a lot of people are worried about microchipping their pets for a variety of reasons. People are afraid it will hurt or that it’s too expensive or that the government will track their pets or that it’s just useless. Well, let us help lay your concerns to rest! Let’s start by how we microchip pets at Market Street Animal Clinic. To begin, we scan your pet with our microchip reader, just to make sure your pet (let’s call him Mr. Fuzzy) wasn’t previously microchipped. This is a completely painless check. We wave our scanner over Mr. Fuzzy’s body. We don’t even have to touch the scanner to him! Next, we will have one of our technicians hold Mr. Fuzzy so he doesn’t get too scared. After Mr. Fuzzy is secure and happy in the arms of the technician, the vet or another technician will gently pull up on the scruff on the back of Mr. Fuzzy’s neck. We will then insert the needle under the skin and press the plunger to implant the microchip under Mr. Fuzzy’s skin. The only pain your pet may feel is the pinch of the needle. Some pets don’t even notice! 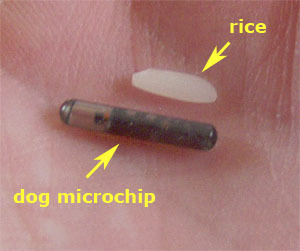 The microchip itself is tiny, just slightly larger than a grain of rice. Now, occasionally the site where the needle was will bleed a little. This is just because there are lots of blood vessels in the skin. The bleeding should stop very quickly. That’s it! It’s over! Mr. Fuzzy has officially been microchipped! Now all that’s needed is for you to fill out a short form with some information that would tie Mr. Fuzzy to you. You then give the form to one of our technicians or receptionists and we register Mr. Fuzzy for you! It really is that simple! Now that you know how the process works, let’s discuss the benefits of Mr. Fuzzy’s microchip. If Mr. Fuzzy were to ever escape from your home or break free from his leash while you were walking him, he could be traced back to you. How could he be traced back to you? Well, if someone were to find him, they could bring him to a vet or animal shelter where he would immediately be scanned for a microchip. When Mr. Fuzzy gets scanned, a number will pop up on the scanner. The vet or animal shelter would then be able to input that number into a database and your name and number would pop up so that they could contact you. There are hundreds of stories of people finding their pets again because of their microchips! If you move or have to re-home Mr. Fuzzy, you can log on to your account online and change the information. And while we are on the subject, if you move, or change your phone number, be sure to update the information! It only takes a few minutes, but it could be the difference between getting Mr. Fuzzy back to you or not. Lastly, the microchips that we use at Market Street are not tracking devices. We cannot log on and see exactly where Mr. Fuzzy is at that exact moment. All that the microchip tells us is your name and phone number. Ready to get Mr. Fuzzy microchipped or have more questions? Give us a call or stop and speak with one of our helpful employees!